The creators behind the live action show, Dinosaurs in the Wild, which will open in Birmingham this summer, will be introducing an educational experience for schools. The new experience will be suitable for Key Stage 2 pupils and will link with the Science curriculum. The experience will virtually transport school groups back 67 million years to the time of the dinosaurs and the Cretaceous period. It has been designed to allow pupils to use their imaginations as they come face to face with animatronic dinosaurs, bringing Science to life. Special rates for school bookings are now available, as well a free tickets for accompanying teachers. The adventure experience will last around 70 minutes and feature cutting-edge effects. 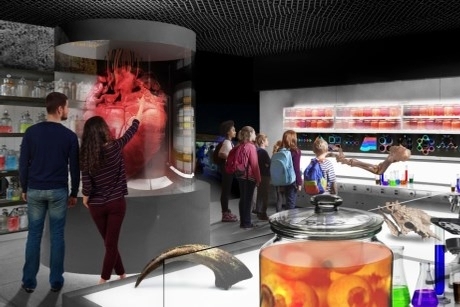 Pupils will be encouraged to ask questions as they explore the surroundings, including laboratories in which they will witness an animatronic dinosaur hatching. School groups will also see scientists conducting a virtual autopsy on a dinosaur, giving them an insight into the anatomy of dinosaurs. Plus they’ll get to use virtual reality to find out what it was like to see through a dinosaur’s eyes. There will also be an array of objects and artefacts on show, such as dinosaur tissue, samples, eyeballs, brains, teeth and claws. The experience ends with a 360 degree view of the dinosaurs in what has been created to reflect their natural environment. In addition to the experience, there will be curriculum linked resources available for all schools booking a visit which will support both English and Science lessons. Dinosaurs in the Wild is a live action show that uses animatronic dinosaurs to take viewers back to the Cretaceous era and envision what it would have been like to walk along dinosaurs. Dinosaurs in the Wild is made by the producers behind the hit BBC TV series and arena show Walking with Dinosaurs. The show will premiere at the NEC in Birmingham in June before moving to Manchester’s EventCity in autumn. For more information, visit www.dinosaursinthewild.com/education.